4. promote education, graduate research and research funding in ecological economics. 1. Organizing a biennial conference on ecological economics in Canada in alternate years with World ISEE conferences. In so doing, the Executive Council should recognize the need for equitable geographical distribution of meeting locations in Canada over time. 2. Organizing biennial CANSEE/SCANÉÉ Business Meetings in conjunction with the biennial conference in Canada. 3. Promoting membership and participation in ISEE and CANSEE/SCANÉÉ. 4. Disseminating information to CANSEE/SCANÉÉ members through a CANSEE/SCANÉÉ newsletter, electronic mail, or other means. Items concerning CANSEE/SCANÉÉ and its activities will also be regularly submitted to ISEE for publication in the ISEE Newsletter. 5. 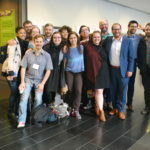 Organizing and promoting other events and activities, highlighting Canadian experience in sustainability and ecological economics as appropriate. 6. Communicating to the people of Canada through the media the ecological economics approach to Canadian and global problems and disseminating key ideas from CANSEE/SCANÉÉ conference proceedings and papers.